The Independent Living Institute (ILI) is a policy development center specializing in consumer-driven policies for disabled peoples' self-determination, self-respect and dignity. Independent Living is a philosophy and a movement of people with disabilities who work for self-determination, equal opportunities and self-respect. Independent Living does not mean that we want to do everything by ourselves and do not need anybody or that we want to live in isolation Independent Living means that we demand the same choices and control in our every-day lives that our non-disabled brothers and sisters, neighbors and friends take for granted. We want to grow up in our families, go to the neighborhood school, use the same bus as our neighbors, work in jobs that are in line with our education and interests, and start families of our own. Since we are the best experts on our needs, we need to show the solutions we want, need to be in charge of our lives, think and speak for ourselves - just as everybody else. To this end we must support and learn from each other, organize ourselves and work for political changes that lead to the legal protection of our human and civil rights. We are profoundly ordinary people sharing the same need to feel included, recognized and loved. The Swedish Inheritance Fund has granted just under SEK 6.8 million to the Independent Living Institute in collaboration with the Raoul Wallenberg Institute to implement the three-year project “Article 19 as a Tool”. “Article 19” refers to the UN Convention on the Rights of Persons with Disabilities: Article 19 – Living independently and being included in the community. The background to the project is that many people with disabilities are still in situations lacking self-determination in their daily lives and being excluded from participation in society. Although Sweden has formally phased out institutions, there are now fears that they are on the rise again due to cutbacks in personal assistance. The concept of institution is not about a certain type of building, but of being deprived of freedom and control. Even small group homes and people living in their own accommodation can being deprived of freedom and control if, for example, they share staff or have little influence over their daily lives. Sweden has ratified the UN Convention on the Rights of Persons with Disabilities, and is obliged to implement the rights under the convention. The UN Committee on the Rights of Persons with Disabilities continue to develop the understanding of the rights under the CRPD. The Committee’s General Comment no 5 on Article 19 (GC 5) makes clear that segregated dwellings where disproportionately many people with disabilities must share the same environment should not be allowed. The notion that people with intellectual disabilities would not be able to live outside a group home or similar is also contrary to Article 19, according to GC 5. The General comment is clear on your right to decide what services you need and what daily activities you will participate in. So how well does Sweden live up to the clarifications expressed in GC 5? Does life in group housing or service housing, for example, meet the requirements of Article 19? And how is it with Conservatorship or Guardianship and influence on daily activities? These are just some of several interesting issues where a clearer instrument is needed to be able to make an objective assessment. The issues are highly relevant because Sweden this year will submit its report to the UN on how the country complies with the convention. Read more (in Swedish) on the Law as a Tool's website. He was a legend already in his lifetime. A small guy in a powerchair using a tracheostomy and requiring 24 hours of personal assistance yet breaking down barriers everywhere he went. When he was elected to the Finnish Parliament, they had to make the building accessible for him and others to follow. As a sort of Finnish Ambassador on Disability he traveled extensively all over the world, participated in most summit meetings on disability, visited countries in the Global South as consultant and organizer on issues of disability and development. Finnair had to put in a power outlet into their business class for his ventilator. When his Green Party organized a political meeting in an inaccessible venue in a northern Finland city early in his political career, he took the train there, held an improvised press conference in a nearby restaurant, made his point about our human right to access and inclusion, and took the four hour train back to Helsinki. His point was not lost. Today, it would be embarrassing for any organizer to exclude persons who use a wheelchair for mobility. When he became a Member of Parliament, his medical doctor reclassified his disability status which meant that Kalle lost his personal assistance. Forced into a residential institution he had no say in when to get up in the morning, and, as a consequence, could not participate in important parliamentary decisions. Finally, after drawing much media attention on residential institutions and the lack of personal assistance he regained his personal assistance and personal freedom. Kalle had Muscular Dystrophy from birth at a time when everybody including physicians expected people with that diagnosis not to survive their thirties. Not despite his ventilator and tracheostomy but because of them he was able to have a ”normal” life, to study Computer Science at the university, to start an organization of students with disabilities, Kynnys Ry (Threshold) in 1973 that was to become the first Finnish disability organization based on Human Rights and Independent Living. 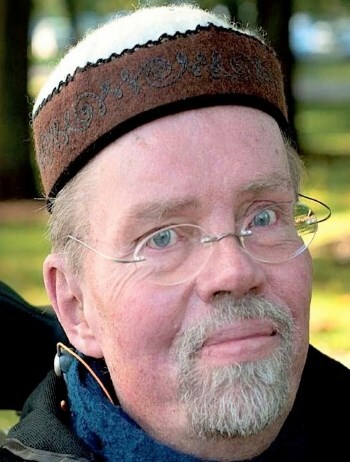 Kalle served 19 years on the Helsinki City Council, was co-founder of the Finnish Green Party, its first national chairperson and Member of Parliament 1983-1987, co-founder of Disabled Peoples International, DPI, its European chairperson, and later its international chairperson. Kalle started and headed the Finnish foundation Abilis in 1998 which, with the support of the Finnish Ministry for Foreign Affairs, promotes empowerment, independent living and social integration of persons with disabilities in the Global South through funding small trustworthy high-quality projects planned and implemented by disabled people themselves. Kalle proved the doctors wrong. Not only did he survive beyond anybody’s expectation, not only did he turn into a national and international giant successfully working for human rights and independent living, most recently through his work for refugees with disabilities particularly in Africa. Not only has he become the best-known person with a disability in Finland which surely must have affected the nation’s attitude. His friends know that he greatly enjoyed life, loved music, the arts and poetry, good company, good conversations, good jokes and food. He and attractive red-haired Maija married in 1976. Until her death in 2012, she was a successful and internationally influential architect showing that accessibility in architecture is no obstacle to beautiful design. Kalle wrote and published children’s books together with an illustrator friend. He loved his summer cottage in the Finnish countryside where he’d spend a whole month each summer. What has Kalle taught us? His life tells us that to have a disability is no excuse for not trying to make the best of your situation. That to be successful in what you are doing, it helps to enjoy your work, to enjoy working with people, to really care about people you meet. Not everybody has the clarity of thought combined with that dry Finnish humor Kalle had so much of. But it can’t hurt to try. Keep abreast of personal assistance policy and provision around the world. Read about the situation in Sweden, other European countries and beyond.